Home Posts tagged "ground pork"
Another backlog entry – this was photographed August 5th, almost a month ago! Bad Blogger! Catching up though, slowly but surely, even if some of the details of these catch-up posts have gone missing from my brain. Perfect to follow the breakfast crepes tacos are actual tacos with home-made flour tortillas. Clearly I need a little more experience making flour tortillas before I’d do this for a meal made for anyone else other than me and the husband – most of them came out oddly misshapen, sticky, and weird, but, they fit the bill regardless of appearance. On the side are a summer favorite, corn fritters, and to top everything off, yet another cucumber and tomato salad. There’s a glass of wine there too, but neither of us can remember which wine it is and I neglected to get a photo that included the bottle (oops). Thinking back, it may actually be a glass of our homemade cider using apples from my grandparents’ house out in central Pennsylvania. Regardless, the whole lot disappeared quickly and was delicious. 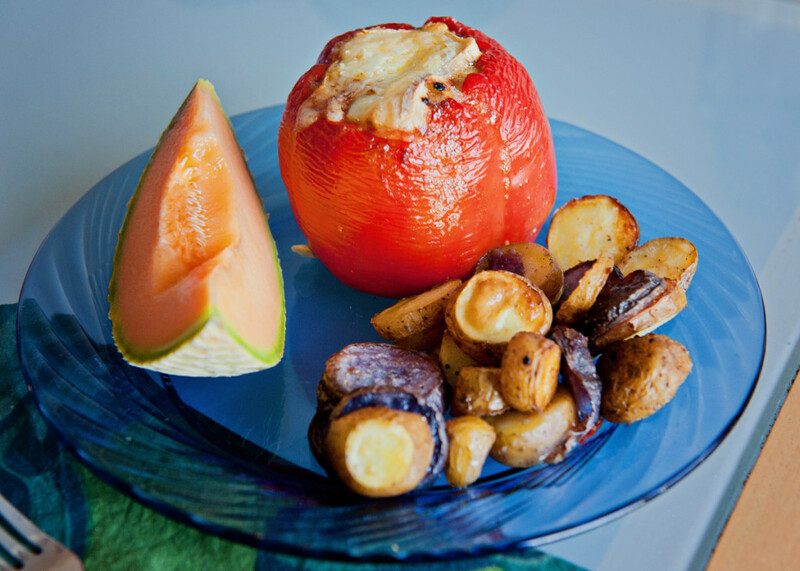 Stuffed Peppers, One Local Summer style! The Anselma market had these huge red peppers and I couldn’t resist. 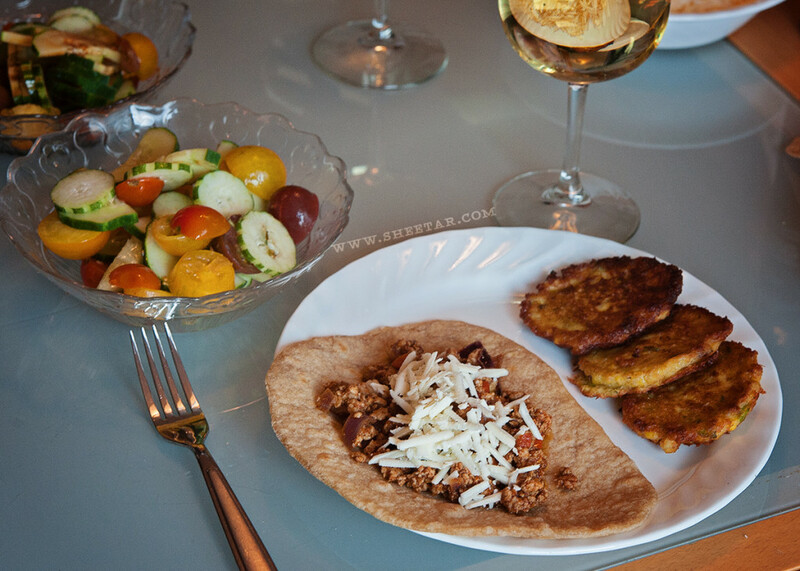 We used ground pork, tomatoes from our own garden, and instead of rice, wheat! The substitution worked out really well, and in fact, I think I might prefer it – the wheat is really much more flavorful than rice, even if it takes longer to cook. Add to that a big chunk of cantaloupe and some potatoes, and it makes for a very filling dinner. It really came out well and I’m SO glad we had leftovers. Yeah, I know I’m behind on blogging again – this was actually prepared a few weeks ago, before vacation, but I’m just finally getting it online now. Oops. Better late than never? I’m sort of split on this one. I had a great idea, it just ended up being poorly executed mostly due to a bad recipe. Yep, that’s supposed to be a taco shell. Unfortunately, I used this recipe, instead of the one I had used before, and got what’s basically a cornmeal crepe instead of a hard taco shell. It leaks, doesn’t hold together, and it basically rubbish. 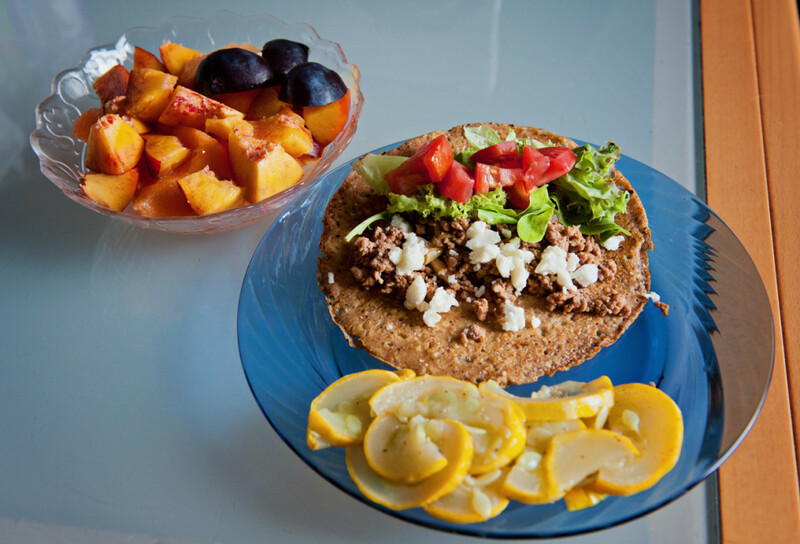 Everything else was great though – the ground pork came out great, the squash was wonderful, the fruit sweet, and the sheep’s milk feta cheese! YUM! Oh well, at least I know better for next time! A quick note on the nectarine and plum – our local orchard was hit by a hail storm earlier this season and fruit has been pretty scarce in comparison with prior years. They put up a sign on their fruit bins at the market that the fruit is, “Hail kissed but still delicious!” It makes me laugh every time, and they’re right. Visual imperfections don’t make the fruit taste any different. Week two! We’re slowly seeing more vegetables show up at the market, and since the husband is away, I jumped at the chance to use mushrooms. He’s not a fan of mushrooms, so when he’s away, I get to have my fill of them. 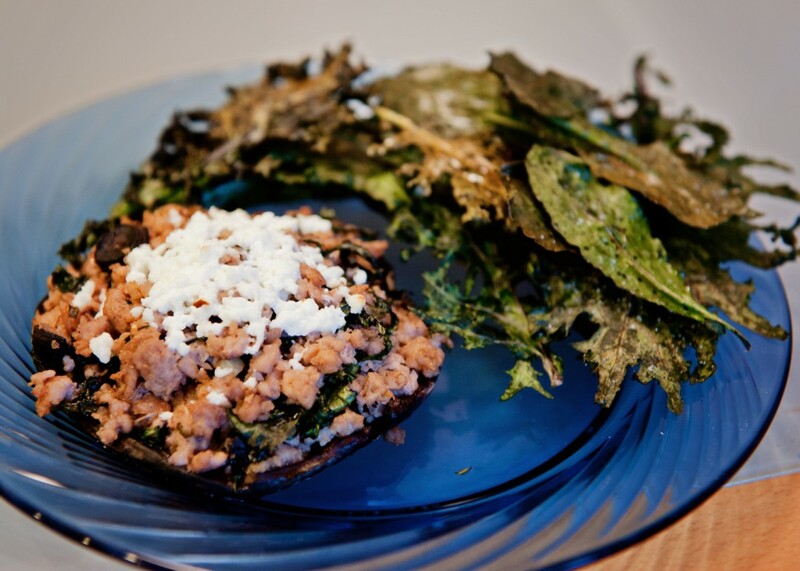 You might not be able to see it in the photo, but that’s a BIG portabella mushroom topped with ground pork, kale, spring onions, and chevre. Pretty easy to make – browned the ground pork in a pot with the onions, mushroom stems, and then added the kale just until it was wilted. Put a heaping scoop of that on top of the mushroom that had been marinating in olive oil and vinegar, topped it off with some crumbly goat cheese, and popped the whole thing into the oven until the mushroom was tender. On the other side of the plate is a pile of kale chips. I’ve heard people talk about how good they are, so I thought I’d give it a try. They’re good, but they’re time consuming and really fragile – kind of like eating one thin layer of phyllo dough. They were fun to try, and the entire batch of chips disappeared quickly, but I don’t think I’d make them again. Overall, the meal was great, and the leftovers are already gone too!